A wealth of security concepts have been covered and now some of the techniques used in areas of your network will be covered that are vulnerable to attacks, in particular, the Demilitarized Zone (DMZ). The DMZ is defined as an isolated part of the network that is easily accessible to hosts outside of the network, such as the Internet. 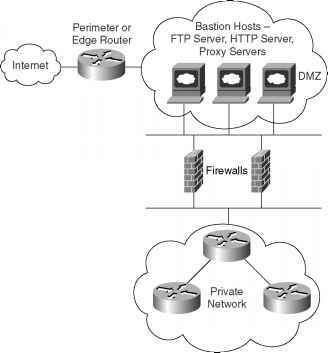 Figure 7-1 displays a typical network design where a DMZ is defined with a number of bastion hosts (first line of defense or hosts that can be scarified in case of a network attack or attacks). 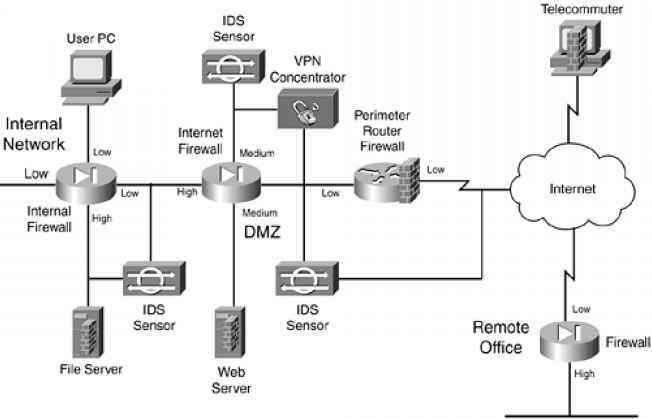 Figure 7-1 displays a typical perimeter network where the DMZ is separated by a firewall. Firewalls are network devices such as Private Internet Exchange (PIX), which are discussed later in this chapter. Firewalls are designed to protect the internal (or private) parts of a network from the public domain. • Serve as a traffic point—The traffic from inside and outside the network must pass through the traffic point. • Authorize traffic—Permits only authorized traffic. • Designed to be immune from penetration—Firewalls are designed to be immune from attacks. Firewalls are still often devices that are attacked by outside hosts. • Invisibility—Ensures that the private network is invisible to the outside world. • Running static or dynamic routing protocols; Cisco PIX is limited to RIP and static routing. NOTE Proxy servers are designed to shield internal devices from outside intruders by replacing the internal hosts' IP addresses with its own IP address. Most new vendors now allow routers to act as proxy servers. Proxy servers have scalability and speed issues, as all packets must be examined and IP headers modified for packet delivery. Firewalls and perimeter routers have the additional function of packet filtering. A packet filter is a device that inspects all incoming and outgoing packets based on IP source address, destination IP address, and protocol type, such as TCP or UDP. Based on configurable options, the filter decides whether to reject or allow traffic to pass through the device. Table 7-1 summarizes the main functions of a perimeter and firewall router. Control eavesdropping with the TCP/IP service and network layer encryption (IPSec). Use authentication, authorization, accounting (AAA), and Cisco Secure. Also, access-list filtering and PIX Firewall. Control what TCP/IP sessions are authorized. Block SNMP, IP source routing, and finger services to outside hosts. Filter internal address as the source from the outside world. Filter all private addresses. Filter Bootp, Trivial File Transfer Protocol (TFTP), and trace route commands. Allow TCP connections established from the inside network. Permit inbound traffic to DMZ only. Allow only valid IP addresses to the outside world and filter remaining illegal addresses. Use predefined access lists that control the transmission of packets from any given interface, controlling Virtual Terminal lines, VTY, and access, and ensuring that routing updates are authenticated. Cisco IOS routers can filter TCP or UDP protocol types. Example 7-1 displays the number of TCP services you can filter on a Cisco IOS router using extended access lists. R1(config)#access-list 100 permit tcp any any eq ? Example 7-2 displays the extended access list when filtering services based on the UDP protocol suite of services. R1(config)#access-list 101 permit udp any any eq ? Examples 7-1 and 7-2 clearly allow a network administrator flexibility when designing perimeter security based on particular port numbers, as defined in RFC 1700.